FC29B in the Hyperflow of History. Covered in multimedia lecture #6668. 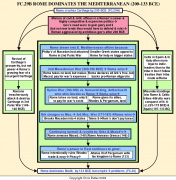 Like it or not, (and many Romans did not), Rome was now a Mediterranean power. This involved it in an ever-widening circle of affairs that it found itself less and less able to avoid contact with. As a result, the next seventy years saw Rome's power and influence growing throughout both the Western and Eastern Mediterranean. Much of Rome’s expansion was tied in with the nature of Roman politics, which were both highly competitive and expensive. A Roman’s public career consisted of rising through a tight mixture of military and civil offices, with success in war being the most important factor. Military victories brought a Roman glory, status (which heavily affected his success in politics), and money (which helped him pay for his political career). Therefore, after 200 B.C.E., when Romans found themselves outside of Italy and far from the control of the Roman Senate, they were often tempted to attack foreign peoples to gain the money and glory needed to continue their careers back home. Although Romans might be eager to win fame and riches, they were generally reluctant to conquer new lands, since that would involve the trouble and expense of actually ruling those new provinces. Therefore, while Rome’s power was clearly dominant in the Mediterranean by 133 B.C.E., a map of the Mediterranean at that time would hardly reflect that power as the Romans during this period often passed up opportunities for conquest. Despite the harsh treaty imposed in 20l B.C.E., Carthage bounced back to regain its prosperity, although not its power. This still worried some Romans who recalled the trials and tribulations of two previous wars with Carthage. One of these Romans, Cato the Elder, was so fearful of Carthage that no matter what the topic of his speech in the Senate, he always ended it with "Carthage must be destroyed." Finally, in 149 B.C.E., the Romans listened to Cato, and tricked the Carthaginians into disarming before demanding the complete destruction of their city. This was too much, and the Carthaginians somehow managed to rearm and put up a furious defense. The resulting siege of Carthage, known as the Third Punic War, lasted three years (149-146 B.C.E.). In the end, the Romans stormed Carthage's walls and leveled it to the ground. This destroyed Rome's most dangerous enemy, but also put a serious blotch on its record for fair play. However, Rome still left most of North Africa to Numidia rather than taking it for itself, showing it was probably motivated against Carthage more by fear than greed. Rome’ wars with Celtic tribes in Cisalpine Gaul (Northern Italy) and Spain were also brutal. However, it was largely cultural differences, especially over their respective concepts of the state,that triggered disastrous misunderstandings between Rome and the Celts. The Romans’ saw the state as being the totality of the people in a society, as expressed in their motto “The Senate and the Roman People” (SPQR). Therefore, any treaty signed by legal representatives of the Roman state was considered binding on all Romans. On the other hand, Celtic peoples, especially those in Spain, were much more loosely organized into tribes. And even if a tribe’s leaders signed a treaty with Rome, other members of the tribe, especially those with their own war bands personally loyal to them, might not agree with it and continue fighting. In the Romans’ eyes, this was a clear violation of the treaty and merited retaliation. Unfortunately, since the Romans could not tell who was guilty or innocent, they often struck against tribesmen who were abiding by the treaty, seeing them all as equally guilty since they were all bound by the same treaty. Naturally, the wrongly accused Celts would strike back, confirming Roman opinions of them and triggering a cycle of hatred and violence that was very hard to break. Therefore, the Roman conquests of Cisalpine Gaul and Spain were especially brutal, involving ambushes, massacres, and broken treaties by both sides. It took the Romans half a century to pacify Cisalpine Gaul and and nearly seventy years to conquer most of Spain. The final conquest of north-western Spain would not be finished until 19 B.C.E. Roman involvement in the East was more reluctant, especially after two exhausting wars with Carthage. However, Rome had already been involved there in suppressing pirates in Illyria and in the war that Macedon had declared on it during the struggle with Hannibal. To some powers, such as Macedon and the Seleucid kingdom, the rising power of Rome seemed a threat. But to others, such as Rhodes and Pergamum, it seemed like salvation from aggression by Macedon and Seleucid Asia. When they appealed to Rome for help, they portrayed their enemies as a threat to Rome as well, pointing out how Philip V had attacked Rome in the midst of its life and death struggle against Hannibal. Reluctantly, the Roman people agreed to declare what is known as the Second Macedonian War (20l-196 B.C.E.). After a slow start, the Romans finally met the Macedonian phalanx at Cynoscephelae. As in the war against Pyrrhus a century before, the legions' flexibility proved decisively superior to the phalanx's rigidness, and Rome won the war. Rome's settlement shows its reluctance to get involved in the East beyond securing Italy's flanks. Rome took no land and only 1000 talents (66,000 pounds) of silver to cover the costs of the war. Either as a generous move or in order to further weaken Macedon, Rome declared all Greeks free from foreign intervention, and by 194 B.C.E. its own troops were gone from Greek and Macedonian soil. However, Rome's troubles with Macedon and the Seleucid Empire were far from over. The Greeks, as always, kept squabbling with each other. This opened the way for the Seleucid king, Antiochus III, to invade Greece. Appeals from various Greeks and the advance of Antiochus' army into Greece led to the Syrian War (192-189 B.C.E.). The Romans turned Antiochus' defenses at Thermopylae Pass, drove him from Greece, and tracked him into Asia Minor. For the first time, Roman troops crossed into Asia. After crushing Antiochus' phalanx and army at Magnesia, Rome made peace, claiming no land for itself, but taking 15,000 talents of silver to pay for the war and giving land to its ally, Pergamum. Of course, Rome's involvement could not end that easily. More squabbling between Macedonians and Greeks led to the Third Macedonian War (17l-167 B.C.E.) with the same basic result. Again, the legions tore up the Macedonian phalanx. And again, Rome took no land, but it did break Macedon into four separate and weak states. By now, Roman patience was at an end. A revolt in 149 B.C.E. led to Rome finally annexing Macedon as a province. And more Greek quarreling led to war, the sack of Corinth, and turning Greece into a Roman province in 146 B.C.E. In 133 B.C.E., the king of Pergamum died and willed his kingdom to Rome, probably thinking annexation was only a matter of time. Two other kingdoms, Bithynia and Egypt, would also be willed to Rome in the next half-century, showing the dominance of Rome in the Mediterranean. Even those areas not directly under Roman rule increasingly felt its presence and would eventually fall. However, as remarkable as the rise of Roman power was, it also brought serious problems that would plunge Rome into bloody civil strife.